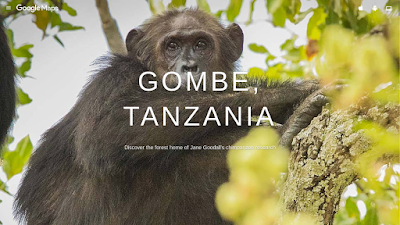 In the Jane Goodall Institute Roots and Shoots online class I'm taking we had an opportunity to explore a Google street view map of Gombe National Park in Tanzania where Dr Jane did her groundbreaking work with chimpanzees. I was excited to see lichen in the opening screen. It looks like shield lichen from this distance. Maps are fascinating to me as I believe they are to all explorers. Google has brought us into a new immersive dimension with street view maps. You get to be there without actually being there. And yet, I'm always concerned about the exotic and far making the familiar and near seem less. Less interesting, less fun - and most worrisome - less important. It is none of these, of course. How do we transfer that sense of wonder and excitement to our local place? Gombe is exciting to us precisely because it is novel. Perhaps looking at our local place with fresh eyes is key. Sunday was sunny and the warmest day we've had in a while-actually above freezing-so I decided to set out to see if I could find any robins. I walked Hilger's Gulch and the play trail, a short circuit around La Framboise and to the river and back on Farm Island. I don't know where the robins are but they weren't in any of those places. I might pop out again Wednesday the next day we are supposed to have a sunny, warmer day. Despite the lack of robins, I did enjoy many birds. I tried to capture the sound of the birds on Farm Island, particularly the cardinal in this video. I think I might need more specialized recording equipment than my phone. You might have to crank it to hear. I wonder if I should use the Sound Cloud app? Side note: It has been a while since I spent so much time outside in the sunshine and fresh air. I figured it was more than 3 hours. I did a short yoga class to stretch out the kinks when I got home. I slept very well. My explorations around food tend to be rather tentative. Still though, over the years I have made changes. I don't eat much meat. I drink tea instead of coffee. 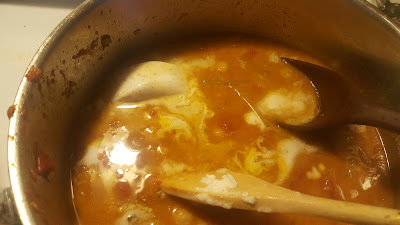 And yesterday, I made a chickpea dish with full fat coconut milk and garam masala. It was (I say this in all modesty) quite good. I had never used full fat coconut milk before. It was not what I was expecting. When I opened the can I was completely unprepared for what looked like shortening. And I was really unprepared for the coconut water underneath when I took a knife and slid it around the can's inner circumference to add it to the pot. There may have been a slosh. I have been using Facebook as a robin journal of sorts, documenting observations (or in this case lack of observations) of robin activity. Last year I shared my First Seen observation via Journey North but I feel the need to bring it all together in one dedicated place. I will pilot using this journal to see if this fills that need. I follow The Prairie Ecologist's blog because he has beautiful photos and well written posts about, well, prairie ecology. He is an example of someone who is an explorer, a prairie ecology explorer. On a cold day with lots of snow, I wanted to try taking photos of the snowflakes. Taken with my Galaxy 6, enhanced with the Low Fi Instagram filter. I am taking another MOOC through Coursera from the Jane Goodall Roots and Shoots program. The class is about Service Learning. I undertook this opportunity because 1) I wanted to learn more about service learning and how we might integrate it at the SD Discovery Center (curiosity!) and 2) I would get a certificate on my Linked In page. I donated money towards a crowd funded scientific research project in May 2017 and then immediately forgot all about it. I received an email with a report about the project which excited me all over again about the possibilities of crowd funded research so I donated to another project. The last few years I have launched Robin Watch, a social media outreach through the SD Discovery Center, on Valentine's Day to encourage people to be more aware of or perhaps hopeful about the arrival of spring. Robins have red breasts and red is the color of hearts and Valentine's Day. Birds often start courtship behaviors this time of year. Even Chaucer noted that. I wanted to give teachers a more content rich way to observe the holiday other than a party and requiring kids to give each other Valentine's Day cards. As a kid, I hated Valentine's Day and all the mushy cards and the ensuing cries of disgust boys made at getting a card from me. This year, I expanded the outreach a bit by making it an official event both on Facebook and our website. My outcome assessment will be if we see an increase of activity on the Journey North website. Below is the kick off post. When I go out for a walk, I bring my camera phone. I take pictures partly as an ongoing documentation of my walks, partly as a way to practice and improve my story telling skills. I don't share every photo I take but sometimes I put one out there just because.